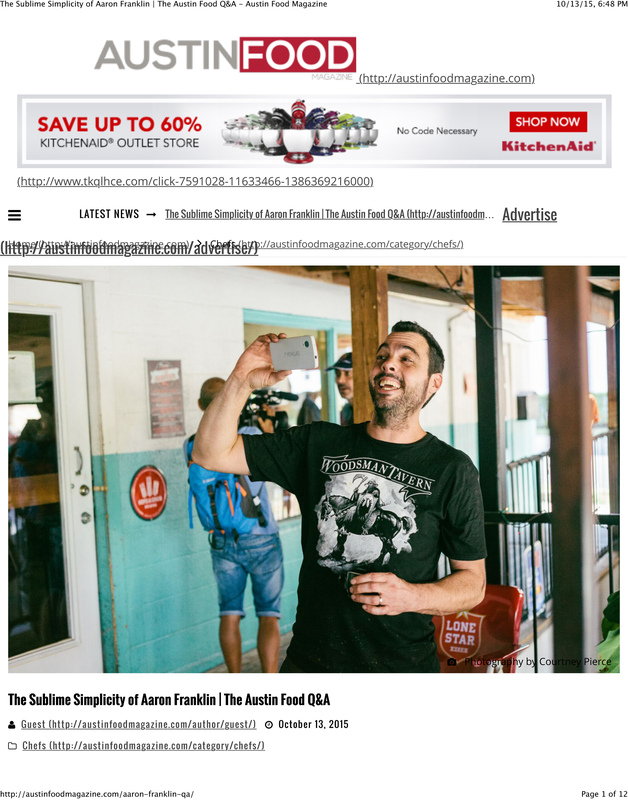 On the day of his exclusive interview with Austin Food magazine, in the middle of his daily rush hour, Aaron Franklin took time out to sit in the shade of the new deck he had built in the backyard at his restaurant at Franklin Barbecue. Sans his familiar and trendy bold-framed glasses, Franklin wore a black Woodsman Tavern T-shirt and jeans and appeared relaxed though he had been working since 1:30 a.m. 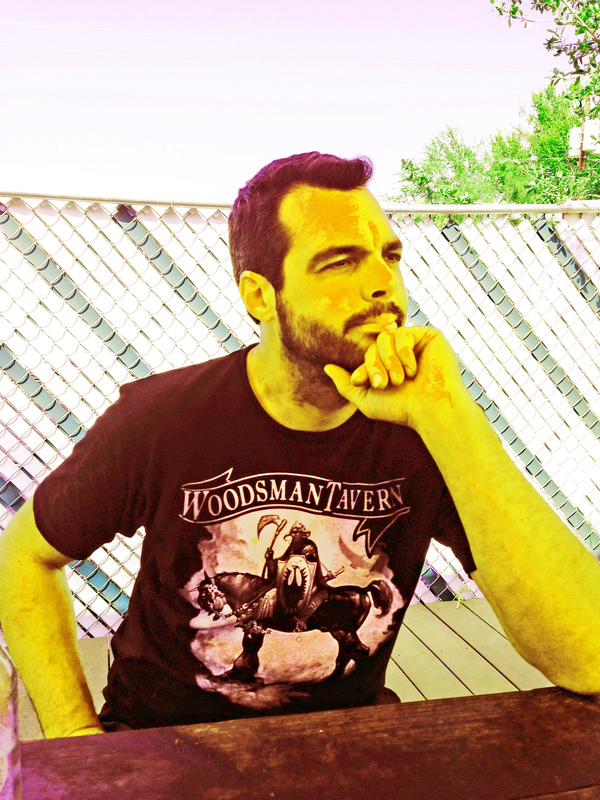 Sporting a full neck beard, the local celebrated author of Franklin Barbecue: A Meat-Smoking Manifesto, and star of his own TV show, BBQ with Franklin, accommodated guests with details and humorous anecdotes regarding his life’s craft and passion. The Bryan native and his wife, Stacy, together with 20 employees barbecue only all natural and prime Angus purchased from 45 Midwest ranches. He won’t ship, doesn’t deliver, and allows only pre-scheduled pickups Tuesday through Sunday. Since 2011 each of Franklin’s five fire pits have smoke brisket, ribs, pulled pork, turkey and sausage at 275 degrees inside a 1000-square foot smokehouse located at 900 E. 11th Street. The Franklins Oct. 4 publicly banned second parties, represented as “professional line-standers and order takers,” from buying large orders of their brand barbecue for resale and distribution. 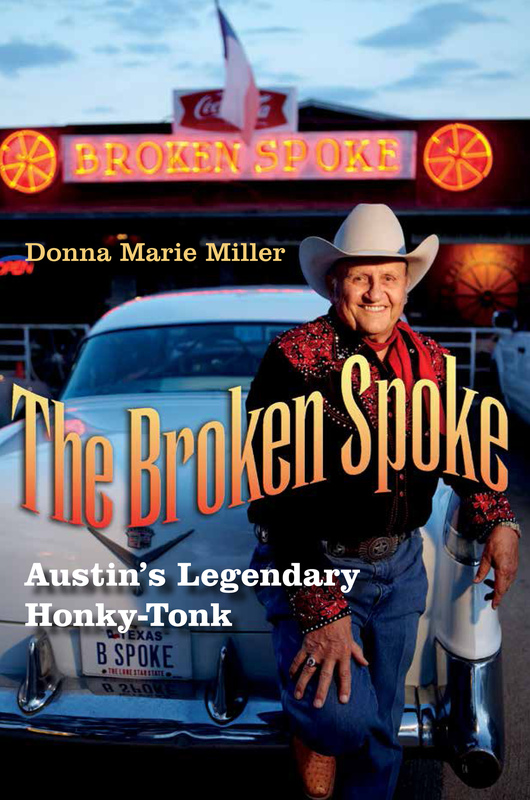 Franklin and Jordan Mackay will read excerpts from their book at 10 a.m. Saturday Oct. 17 inside the Texas Tent at the Texas Book Festival. The event is free and open to the public and takes place at the State Capitol and surrounding grounds Saturday October 17, 2015 from 10 a.m. – 5 p.m. and 11 a.m. – 5 p.m. on Sunday, Oct. 18. What’s the best wood to use when cooking barbecue? Franklin: We use post oak here, which is an indigenous white oak here in Central Texas — really specific to Central Texas barbecue. If you look at all the different regions of barbecue over the years most of that stuff – most of those flavors at least – have been determined by the regional wood. You have hickory in one part, you have mesquite in another part of the country. Here we have post oak and that’s kind of the German/Czech style of barbecue, which is what we cook. So, there’s plenty of it. It stacks good. It burns reasonably well, it has a slow heat curve and it tastes good. What’s key to picking out the right cut of meat to barbecue? Franklin: I think it’s key that you buy the best thing that you can afford. You know barbecue traditionally has always been kind of a cheap piece of meat. The really ‘old school’ guys don’t really care if it’s select, or it’s this or that breed, or if it’s got growth hormones, or not — they don’t really care. If it’s cheap, they say ‘I’m gonna cook it.’ That’s good. If that’s what you can afford, then cook that. If you can afford better, then do a little better. Do the best you can. What’s the best advice you can give to a do-it-yourself home barbecue chef? Franklin: Patience. Patience. Patience. It takes such a long time to cook this stuff. You know, I think the thing you need to realize with barbecue is that there’s really no right way to do it and there’s really no wrong way to do it. It’s just kind of your way. Just try new things. Obviously it’s trial and error. You can’t get bummed out if you get a huge piece of meat and it doesn’t really turn out the way you want it to because it’s a lengthy process. I mean we have 44 hours of labor that go into each brisket here. That is a lot of work. If you think about something that takes that long and any little thing that could go wrong, it would be so magnified by the end of the cook. You learn from your mistakes and you just keep going and trying to do the best you can. You started your business out of a food trailer in 2009. It’s that one right there. It’s really mostly just for storage now, but it’s still here. No one’s stolen it yet. You’re 37 now, so how old were you in 2009 when you started? It was right before my 33rd birthday. What influenced you to do that? I like barbecue. We’ve been cooking barbecue for years and years. My parents had a barbecue joint when I was a kid. It was in Bryan, Texas — which is where I grew up. I moved here as soon as I could. What was the name of their joint? It was called Ben’s Barbecue. No, no they sold it. They got wise got real quick and decided to sell it. I should have learned. So you got your start there working with them? I worked there when I was about 10, 11 or 12, something like that. Skip ahead many many years. Stacy and I ended up getting a little offset cooker that I’d bought at Academy real cheap, bought a brisket and kinda kept doing it. It’s been about 13 years ago I guess, and then we had backyard barbecues. All that stuff’s in the book. So really your training was practice. Oh yeah, totally. That’s how this barbecue thing works – just trial and error. In 2011 you opened here and you’ve sold out daily since. Wow. That’s incredible. We were selling out at the trailer also. How many pounds of beef a day is it that you cook? Hmm, we’re probably sittin’ on — just beef – I betcha maybe 1800 pounds a day. Eh. I don’t know. I haven’t calculated. We cook enough. How many pounds of meat a day? We’re cooking about 2000 pounds a day of total meat. On like a busy Saturday we probably get close to 2200, 2300 pounds. Unlike a cold, slow wintery day I bet we probably cook maybe 1600, 1700 pounds. And that’s just mostly for people that are in line. We do the pre-orders so some of that’s for pre-orders, some of it is for vacuum-sealed orders that people pick up you know for little travel briskets and stuff, but yeah the majority of it is for service. The way it works, you only allow pickup orders on certain scheduled days. Yep. That info is on Franklinbarbecue.com. If you were to just take pre-orders you would have nothing left for the people in line. Well, we don’t have enough time to get the pre-orders out. We only have about 45 minutes in the morning. ‘Cause all the food starts coming off and it’s ready to serve about 10; we already shift our cook schedule up an hour which is kinda painful at midnight to get everything ready for 10. Then say from about 10 o’clock to 10:45 people start picking up their orders. So we only fill a certain amount of orders that we can actually fulfill in a small window of time and then we have to turn around and get ready for service within minutes. Then it’s just blast through for the next four hours. How many hours a day do you cook? It’s 24 hours a day. We never stop. I got here at 1:30 this morning, which I don’t normally do, but I did it today. Yeah. Well, that’s what barbecue is. Oh, probably about 20 right now I guess. President Barack Obama ate here in 2014. What was that like? Ah. Pretty cool. He’s just a dude that likes barbecue. We talked for a while. He was cool. He talked just like a normal guy. It was cool. We sat around and talked for probably 45 minutes. It was nice. He’s a nice dude. He’s a nice speaker. Bon Appetite magazine named yours the best barbecue in the country, Texas Monthly says it’s the best in Texas, you’ve been anointed the “king of barbecue in Austin,” thanks to Instagram and the Internet. You’re also the only barbecue chef ever to receive the James Beard Foundation Award. How has fame changed you or your business? We cook more food now than we used to. That’s about the only difference. Oh, I have no clue. This is like dumb redneck barbecue. It’s like ‘oh we need 60 briskets for this,’ and then we, cook 60. We don’t run numbers, we don’t do percentages or estimate food costs and such. We have five meats that we have to cook and that’s what it is. We keep it real black and white. That’s what it is. It’s extremely simple. We expend most of our energy on actually cooking and serving food. So, we have a pretty dumbed down, keep it simple rule; don’t mess it up. And you can tell – we have projects aplenty. There’s stuff going on everywhere. Yeah. I hit that with a tractor digging a hole that all that water’s dripping into. You said in your book that you claim to be more of a ‘thermal engineer’ than a chef. Tell me about your love and respect for fire. Fire’s neat. It’s cool. I think it’s charming ‘cause it’s such a primitive way to cook. I think that’s neat. It’s a variable. There’s a ton of different things going on. You know we build all of the barbecues pits and stuff and cook with fire. It’s neat; it’s exciting. I mean, ovens are boring. Let’s cook on fire. It tastes better. You’ve said on record that you do not prefer recipes. Instead you prefer to write about the relationships between your key ingredients: wood, smoke and meat. Tell me about your ‘low and slow’ approach to cooking barbecue. How in-depth do you want this? In 400 words or less. Ok, ‘cause I did write a whole book on that. Yes. I know. However, for the Q and A, an emotional response is good. You’ve said that patience is key. You just cook stuff. We’re in Texas. We make barbecue in Texas. Watching a fire, there’s something. I appreciate kind of being able to watch fires and pick a piece of wood and watch and see how the airflow’s working. I specifically like barbecue because you get to tinker with stuff, you get to build things — I get to build things. I enjoy building things, obviously. None of them are finished. This deck is finished. So it’s kind of cool. It’s not just cooking. You’re not in the kitchen, you get to be outside, you get to play with fire. You get cook stuff, you get to poke at things, you get to smell things, you get to watch the sun come up. It’s nice. It’s charming. It speaks to my soul. Do you have any German or Czech blood in you? What do you feel is important to Franklin Barbecue when it comes to meat? We don’t do growth hormones, we use all natural stuff, we use Angus specifically and we only use prime. That’s what I like to cook. That’s what I think turns out best, but I mean really if we didn’t cook 100 briskets a day – maybe we would use something different. And there’s almost no fat. What are your feelings about the fat? Well, all cows have fat, so a lot of it depends on the breed, a lot of it depends on the feed, a lot of depends on the climate that the cow was raised in, a lot of it depends on how it was harvested, if it was stressed, and if it was cold outside. There are tons and tons and tons of factors that play into that. Marbling is definitely the most important type of fat, but then if you get into that, are there growth hormones or are there no growth hormones and was it this or was it that? They all melt at different temperatures and heat a little bit differently. Where do you get your cows? We get them from pretty much throughout the Midwest. No. No. That’s all pretty corporatey, like feed-lotty like up there. There’s not a lot of all natural stuff in high volume. What states in the Midwest do you like the best? Well, we’re pulling from like 45 ranches right now so there are many states to consider. Forty-five ranches. How did you develop those relationships? That’s amazing. Well, we get them all processed at one place. If we’re cooking 100 briskets a day — that’s 50 cows a days that we’re going through. There is no ranch that could possibly support that. I spend a lot of time sourcing things. Do you visit those ranches? I go up north about probably twice a year. You know where our stuff gets harvested and processed, I go up there probably twice a year. I do a lot of work on that stuff. Outside of promoting your book and your TV show, are you doing other types of traveling too? I sure try not to. We really just try to stick around here to try and run this restaurant and keep as good as we can. That’s our number one goal. We’re just pretty much little shopkeepers around here. This summer I did a couple of pop up dinners over the summer. I cook a festival up in Portland ever year, but outside of that it’s pretty much it. I don’t do food and wine festivals and I don’t cook for barbecue competitions. When you’re not here, who’s in charge? Stacy? Oh my God, who’s in charge? Yeah, Stacy, Benji, and everybody who is pretty much always here. He is the manager of the restaurant. Jacob. He’s also my best friend from high school. He helped us build the trailer. So you both came from Bryan. Yep. Yep. We did. Well, really College Station. That’s so cool. Did you attend college in College Station? No. No. No. I turned 18 and pretty much left at 12:01 a.m. So the book, the TV show, what is planned next for Franklin Barbecue? Keep making barbecue, keep trying to make people happy, that’s it. You have so many customers who are regulars here. I saw a man in a Mercedes pull up and load his trunk with two cases of meat right out front. Yep. He comes here every two weeks. Yep. It’s a cool little thing we’ve got going here. You’ve established some relationships with your customers, not just business. It’s kind of like you’re coming to Grandma’s house. Like: ‘Hey shug, what do you need? Are you thirsty? Aww. Oh, you’re getting sunburned, have some sunscreen.’ That’s pretty much what we do. That’s one of the perks of being here in East Austin. Well, that’s one of the perks of having your own place. You can make it the way you want it. You can treat people the way you want to be treated and again that ever-evolving theme of barbecue, just do the best you can. Barbecue is a religion among most Texans. It can be. People have very strong opinions about Texas barbecue. I’m not one of them. So you don’t have any religion where barbecue is concerned. Nah. Just do what you want to do. Make it the way you want to make it. So, do you have any plans to enlarge your space? We encroach all four property lines on our building. There is no place to go. We added on this smokehouse last summer and that pretty much is the property line right here – within a foot of it. Yeah, this is it. This is what we do and we’re real flippin’ happy to do it. A lot of people like that you’re located in East Austin instead of downtown or say, Westlake. Nah. That’s not really our scene. How close are you to keeping true to that, no matter how much money you make, no matter how much fame you obtain? How much are committed to that idea of staying in East Austin? One hundred and one million percent. Yeah. Who wants to be a sellout? We’ve got ethics. We’ve got integrity. We’re not compromising anything. What about putting things in commercial sales? We have the sauce in stores already. We started bottling that stuff a couple of years ago for customers that travel who need to have the actual sealed bottles. We don’t ship at all. You have to come get it. That’s a can of worms that we have no interest in getting into. People often make the drive. They say they NEED it. Well, we do put a little bit of crack on the brisket. No. No. That’s true. It’s trace amounts. I’m not kidding. That’s why we’re close to 12th and Chicon. For the record are you sure you want to say that? Yeah, you can put that in there. I don’t care. I’m totally kidding – a little bit. The TV show isn’t about you. It’s about the meat and the fire and the smoke. It’s kind of just about what we do. It’s a pretty awesome show. I don’t want it to be about me even though it is called ‘BBQ with Franklin.’ Dang it. No. It’s just about barbecue in general. It’s about celebrating this culturally iconic cuisine that we have. Do you have plans to move the TV show to the Food Network? No. Just I turn them down over and over. I don’t want to do it. We have a restaurant to run and if we got distracted and started doing other stuff then what good is this place? What good are we if we can’t keep up with the restaurant? We have a 2-year-old daughter. So she’s on track to learn to make barbecue. She’s working right now. Scoopin’ potato salad up front. Vivian. She’s the one up there with the red apron on. She has a little tiny apron. No I’m kidding. She’s at home, but she does wipe tables. Oh, but I’m not very serious by the way. So you open every day at 11 a.m. What time do you close it down every day? Normally around 3-ish. When it’s gone, it’s gone. We go up and down the line and make sure that everyone that we let stand in line is gonna get fed. We figure out what people are going to get and let them know what we’re out of. Then we let them give their kids snacks when they get hungry. We make sure people aren’t getting sunburned or too drunk or anything. We try to wrap it up and have a nice smooth follow-through. What do mean? There are no bad days. We’re alive and doin’ what we love. I count that as a good day. So you’re done at 3. Do you have any free time? Or vacations? No. We don’t have free time. We close for 10 days every year to go on vacation. Everybody goes and does there own thing for 10 days and then comes back. Normally in July, some time in July. That is totally a busy month for barbecue, but it’s also a good month to go on vacation. In July it’s hot here and it gets hot in there. It’s normally about 140 degrees in the smokehouse. In the summertime that’s what we’re clocking as ambient temperature. It’s pretty bad. Right now there are five fires going in a 1,000 square feet with very poor ventilation and each one of those fires is about 700 degrees. You went on record in opposition to the proposed city ordinances that would attempt to limit the smoke from barbecue joints. Some things were proposed as potential solutions. The stuff that was kind of written into the city ordinance would have been ineffective anyway. So, I pretty much just went up there and talked to people. The point I was trying to make was just be a good neighbor. Don’t be a jerk. If your smoke is going into somebody’s yard, go talk to them about it. You know we’re all part of a community here. It’s no bit deal. This place has been a barbecue joint since 1964. When we moved in, that building wasn’t there and there were two houses back there. That apartment wasn’t there; it was nothing over here. As our city grows, that is definitely something that people will have to deal with. Just be friendly. What was the name of this barbecue place before? It was Ben’s Longbranch. It started here in 1981. Before that it was just a million little taquerias and I think it was a daycare for a while back in the ‘70s, but it started off as a barbecue place. We’re keeping it that way. Can you think of anything else that you’d want to share with our readers? Well, my favorite color’s green. I don’t like pine nuts. I can’t think of anything. Do they come and eat at your place? Nah. Not too frequently. Nobody really eats here. No. It’s just ‘Yeah, that pretty cool. Looks neat.’ They’re real excited about the place, but they don’t really come to eat. Yes. That shipping container is actually chock-full of inventory for T-shirts. We have to have shipping container just for T-shirts. I’d like to buy a T-shirt and some barbecue to take home to my husband. Well, let me see what we can do. We may have cut off the line, so we may not have any for you. If we’ve already guaranteed everyone in line, we can’t sell ourselves short. Because old Billy Bob might not get his sandwich later and that would be bad, but I can get you a T-shirt for sure. I would have to come back another day and request a pickup? Sure. We can do that. We’re sold out for pickups for this month (October,) but perhaps shoot us an email for November. It’s tricky. Thank goodness I don’t deal with the pre-orders. Stacy, and Benji, and Claudia and Mickey, one of the other managers, here do that stuff.